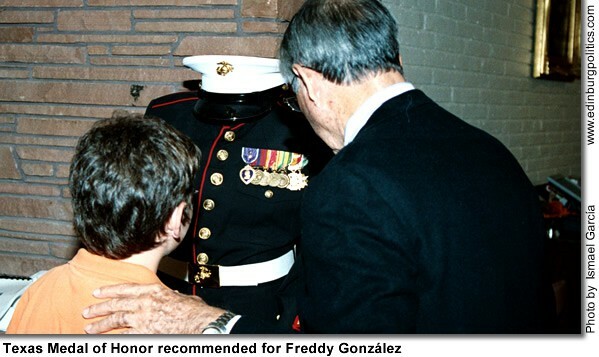 Area residents recently had the opportunity to view the U.S. Marines dress uniform, complete with military decorations, of the late Alfredo “Freddy” González of Edinburg. The Texas icon, whose bravery and sacrifice during the Vietnam War prompted the nation a generation ago to bestow upon him the Congressional Medal of Honor, has now been recommended for the state’s highest military award – The Texas Legislative Medal of Honor. Rep. Aaron Peña, D-Edinburg, has filed the needed legislation nominating the combat Marine for the exclusive state honor. See story later in this posting. 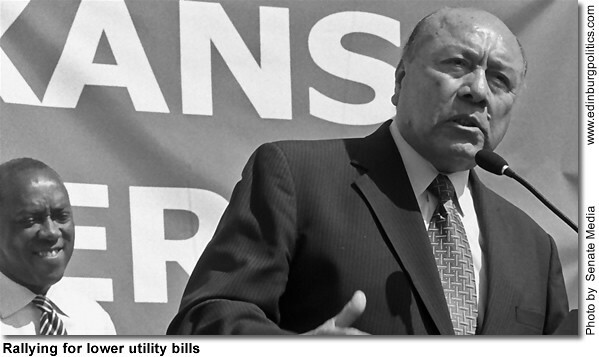 Sen. Juan “Chuy” Hinojosa, D-McAllen, on Tuesday, February 27, spoke from the front steps of the Texas Capitol during a rally drawing attention to legislative efforts to reduce electricity rates for Texas residential users. A large gathering showed up for the event, which included members of the American Association of Retired Persons. AARP is supporting Hinojosa’s Senate Bill 444, a bill designed to bring stability to the state’s deregulated electricity market. Rates have risen by as much as 100 percent in the past five years, Hinojosa said, giving Texas one of the highest rates in the nation. See story later in this posting. Julie González of Edinburg. featured here in the Senate chamber with her boss, Sen. Eddie Lucio, Jr., D-Brownsville, is one of several Edinburg residents who are working in key positions of influence at the State Capitol in Austin. González is serving as a legislative aide with the Senate Committee on International Relations and Trade, which is chaired by Lucio, whose legislative district includes portions of Edinburg. See story later in this posting. A proposed $80 million retail shopping center that has been in the development stage for about a year would create 1,300 jobs and have an estimated $90 million annual economic impact in the three-time All-America City, the Edinburg Economic Development Corporation has announced. The first major estimate of the economic impact of the complex was released by the EEDC during its board of directors meeting on Tuesday, February 27. The shopping center, being developed by First Hartford Realty Corporation, Inc., which is based in Manchester, Connecticut, is scheduled to be built on about 130 acres of currently vacant fields in south-central Edinburg. The targeted site is bordered by U.S. Expressway 281 and Business Highway 281 to its east and west, respectively, with Trenton Road serving as its southern border. Groundbreaking at the site for the first phase of the shopping center, which could take up to three years to complete, is tentatively scheduled for early summer, he said. As part of its strategies to help promote the creation of the retail center, the EEDC board of directors on February 27 approved a resolution authorizing the EEDC, which is the jobs-creation arm of the Edinburg City Council, to participate in key incentives to help spur the project. The EEDC, a governmental entity, is chaired by former Mayor Richard García, and includes Mayor Joe Ochoa, Fred Palacios, Mike Govind, and George Bennack on its five-member board of directors. The board of directors are appointed by the city council, with the exception of the mayor, who is automatically on the governing board. At that Tuesday evening public session, the EEDC gave its official approval to a proposed package of economic incentives – adopted a week earlier by the city council – that would help the outdoor retail stores developer cover certain portions of the costs of making the retail complex a reality. Those incentives, which would involvement reimbursements for public infrastructure, such as new water and wastewater lines and roadway improvements, would materialize only if the shopping center meets specific benchmarks required under the incentives proposal. Those benchmarks include the shopping reaching a certain level of local sales taxes generated, new jobs created, and retail space constructed three years from its groundbreaking. The proposal, approved by the city council and EEDC, “commits the developer to build at least 800,000 square feet of retail space and create 1,300 jobs over a period of three years,” Garza said. The proposed incentives have been in the works for months by the city council and EEDC board of directors during their respective public meetings. To that end, the city council has been working on creating a special city panel that could designate the shopping mile site as a Tax Increment Refinancing Zone, otherwise known as a TIRZ. But before that entity is formed, the city and EEDC wanted to have the incentives proposal ready, Garza added. TIRZs are special districts created by a city council or other governmental entity, such as the county government, to bring new investments into a community. TIRZs are authorized by state law to help local governments help pay the cost of redeveloping or encouraging development in a region that has no planned economic activity. “That process will be initiated in the next month or so designating the areas of the TIRZ and capturing all the incremental value of the construction activity there, and utilizing that to reimburse (the shopping center developer) for public improvements,” he said. First Hartford Realty Corp., Inc. is designing a “Lifestyle-Themed” complex to be located between U.S. Expressway 281 and Business Highway 281 in south Edinburg, bordering Trenton Road to the north. Last spring, company leaders provided the first major update of their goals. “We are pleased to announce our plan to develop the property which is being designed to host a variety of national and regional retailers, sit-down restaurants and other retail amenities,” said John Toic, Director of Project Development for First Hartford Realty Corp., Inc.
“In addition, the site is being designed to accommodate possible hotel and entertainment uses as well. The center will serve the expanding base of Rio Grande Valley shoppers and will draw shoppers from throughout the region and Mexico,” he added. The company has more than 50 years of national real estate development experience. The proposed retail mecca would be the latest big addition to the city’s continuing economic growth. Plans for the shopping center were first announced about a year ago by then Mayor García, and both he and current Mayor Ochoa are leading the city’s efforts to package the incentives. He said some of those incentives to be offered by the city include “reimbursements for public improvements that would be dedicated for public use, and also involve certain levels of sales tax incentives and reimbursements, provided they meet construction of square footage. It is a phased-in incentive package. “First Hartford has advised the city that a significant contributing factor that would induce First Hartford to locate and construct the facility in the city is the ability to obtain certain economic development incentives to would assist First Hartford in being able to finance to facility,” Ochoa added. One component of the economic development incentives being provided to the shopping center’s developer, under the development agreement by the city, is a commitment from the city to grant to the First Hartford a portion of the city’s one percent sales tax revenues collected within the Tax Increment Reinvestment Zone to be created by the city, said García. The city is authorized under Texas law to grant public funds for economic development purposes pursuant to a “program” established under Chapter 380 of the Texas Local Government Code. A resolution approved Tuesday, February 20, by the city council authorizes the establishment of such programs, which must occur before the city grants public funds for economic development purposes. As a result of the passage of that resolution that evening, the city is able to provide a one percent city sales tax grant detailed in the development agreement. As part of its economic development strategies, the city council previously authorized the creation of the Local Government Finance Corporation (LGC) to assist with financing and constructing economic development projects within the city in order to promote economic development and to stimulate business and commercial activity in the city, all at the request of the city council. More details on the mechanism of a Tax Increment Reinvestment Zone are provided by the City of Houston, which has 22 TIRZs. What Are Tax Increment Reinvestment Zones (TIRZs)? Tax Increment Reinvestment Zones (TIRZs) are special districts created by a city council or other eligible local government to attract new investment to an area. TIRZs help finance the cost of redeveloping or encouraging infill development in an area that would otherwise not attract sufficient market development in a timely manner. Taxes attributable to new improvements (tax increment) are set-aside in a fund to finance public improvements in the zone. •To proactively address the decline of major activity centers. TIRZs are most successful when the area’s tax base is at a low point of its valuation and there is a large property owner/developer who can expeditiously carry out the area’s redevelopment. The term TIF, or tax increment financing, is used interchangeably with TIRZs. As new construction in the zone occurs, the resulting annual incremental increase in tax revenue above the base amount is returned to the zone for the duration of the zone. For example, if the assessed value for a base year is set at $6 million and improvements to the area increase the assessed value to $7 million; the taxes collected on the additional $1 million, or increment, is earmarked for the TIRZ fund to pay for project costs. TIRZs have no taxing or assessment powers. Property owners pay a normally increasing tax bill. The cost to the city is that the increment that is captured is preempted for use in the zone rather than for the City’s general fund. Eligible project costs are associated with public improvements. These improvements can include capital costs (the acquisition and construction of public works and public improvements, and building rehabilitation costs); financing costs (including all interest); real property assembly; relocation costs; professional services; and, creation, organization and administrative costs. Projects that are implemented prior to an increment being realized are often financed by a developer and are later reimbursed as an increment is realized, or through the issuance of bonds. Projects can also be financed on a pay-as-you-go basis. TIRZ’s can be city-initiated, if less than 10% residential land area, or by a petition. TIRZs created by petition must be submitted by owners of property constituting more than 50% of the appraised value of the area. Additional areas can be annexed into the zone at a later time through the initiative of the city, if it meets the less than 10% residential rule, or by property owner’s petition. The zone, plus all other existing zones, may not exceed 15% of all taxable property in the city. In Houston, a board of directors governs a TIRZ. Non-petitioned TIRZs are governed by between five and 15 directors. Each taxing jurisdiction levying taxes within the TIRZ are allotted one position on the board, while the Houston appoints a minimum of five directors. Petition TIRZ boards must have nine members that include: five city representatives (that must own or represent a property owner within the zone); one state senator appointment; one state representative appointment; one representative each from the county and school district (if participating in the zone). Houston city appointees serve two-year terms. Houston may delegate to the board any powers granted under state law, except for eminent domain and taxing powers. Powers include land use controls, in special cases; design standards; recommendations for the administration of the zone; and, powers to implement a project and financing plan. Lt. Governor David Dewhurst and Speaker of the House Tom Craddick, R-Midland, on Friday, March 2, announced Senate and House appointments – including Sen. Juan “Chuy” Hinojosa, D-McAllen, and Rep. Aaron Peña, D-Edinburg – to the newly created Joint Select Committee on the Texas Youth Commission (TYC). The committee will be charged with studying recent allegations of sexual abuse at certain facilities administered by the TYC. It will also examine the agency’s policies and procedures, and make recommendations for how to improve its future oversight of youth being rehabilitated in these facilities. The committee will be co-chaired by Sen. John Whitmire D-Houston, Chair of the Senate Criminal Justice Committee, and Rep. Jerry Madden, R-Richardson, Chair of the House Corrections Committee. The Senate appointees are Sen. Chris Harris, R-Houston; Sen. Juan “Chuy” Hinojosa, D-McAllen; Sen. Kel Seliger, R-Amarillo; Sen. Florence Shapiro, R-Plano; Sen. Royce West, D-Dallas; and Sen. Tommy Williams, R-The Woodlands. The House appointees are Rep. Harold Dutton, D-Houston; Rep. Aaron Peña, D-Edinburg; Rep. Larry Phillips, R- Sherman; Rep. Debbie Riddle, R-Tomball; Rep. Sylvester Turner, D- Houston; and Rep. Corbin Van Arsdale, R-Tomball. The Joint Select Committee on the TYC was created to coincide with the Legislative Audit Committee (LAC), which met on Friday, March 2, to examine the conduct and fiscal management at the TYC. The committee voted unanimously to recommend that the governor appoint a conservatorship, and it also recognized that the Governor could create a state agency rehabilitation plan to be submitted within 15 days. The LAC is a permanent standing joint committee, co-chaired by the Lt. Governor and the Speaker, whose role is to provide guidance to the State Auditor’s Office. More than a generation after Marines Sgt. Alfredo “Freddy” González died saving his troops in Vietnam, the Texas Legislature is poised to posthumously bestow upon him the state’s highest military decoration. The legislation, House Concurrent Resolution 121, was filed Monday, February 26, by Rep. Aaron Peña, D-Edinburg. Sen. Juan “Chuy” Hinojosa, D-McAllen, is expected to sponsor the measure in the Senate, which will require approval by Gov. Rick Perry if the legislative resolution is adopted by the Texas Legislature. The military decoration is a neck ribbon is green with white stars, and the medal features an image of the Alamo Mission in San Antonio and the six historical flags of Texas. John Flores, author of a new book, “Where the River Dreams” (Publisher: AuthorHouse), which chronicles the life of the Edinburg war hero, praised the decision to recommend the state’s highest military honor in memory of González. The Texas Legislative Medal of Honor (TLMH) was established by the 58th Texas Legislature, and has been awarded three times throughout its history to those who voluntarily perform a distinguished deed of personal bravery, or self-sacrifice involving risk of life. Prior to September 2003, the governor determined the TLMH nominees and awards the TLMH upon passage of a resolution confirming this person by both bodies of the legislature. Additionally, there were no residency requirements for the TLMH. That law changed in September 2003, when the new law, authorized by House Bill 573, established certain residency requirements and TLMH nominating and awarding criteria. The legislation also established a committee of legislative branch officials and the Texas adjutant general to designate award recipients. RESOLVED, That an official copy of this resolution be prepared for the family of Sergeant González as an expression of highest regard by the Texas House of Representatives and Senate. Members of the AARP gathered from all across the state Tuesday, February 27, to join State Sen. Juan ‘Chuy’ Hinojosa, D-McAllen, at a rally on the grounds of the Capitol in Austin, pressing their case for lower electric rates and more consumer choice. AARP is supporting Hinojosa’s Senate Bill 444, a bill designed to bring stability to the state’s deregulated electricity market. Rates have risen by as much as 100 percent in the past five years, Hinojosa said, giving Texas one of the highest rates in the nation. •Injecting true competition into the deregulated market by requiring electric companies to reserve at least 25 percent of their electric load for residential customers. No more cherry picking the Texas market by going after high-dollar commercial or industrial customers only. “All Texans want is a fair price and to not have to wade through a confusing mess of rules and policies when they want to change their energy provider,” Hinojosa said. A bill that would allow the Texas Attorney General’s Office to establish an address confidentiality program to help protect victims of family violence, sexual assault, or kidnapping has passed its first hurdle by getting a public hearing before the House Juvenile Justice and Family Issues Committee. The plan, which has 22 House co-authors, including Rep. Eddie Lucio, III, D-San Benito, and Rep. Juan Escobar, D-Kingsville/Willacy County, is being carried by Rep. Verónica Gonzáles, D-McAllen, and Sen. Eddie Lucio, Jr., D-Brownsville. Almost 2,000 Texans would qualify for the protection in the first year, according to initial estimates presented to the Legislature, and would involve almost 114,000 piece of mail in its inaugural year. Under the measure, the Attorney General’s Office would establish an address confidentiality program that would designate a substitute post office box address that a participant may use in place of the participant’s true residential, business, or school address; act as agent to receive service of process and mail on behalf of the participant; and forward to the participant mail received by the office of the attorney general on behalf of the participant. Gonzáles’ version, House Bill 569, received a public hearing at the State Capitol on Wednesday, February 28. It was left pending, which is routine to allow proponents and opponents of the legislation time to hammer out compromises or add new language. Lucio’s bill, Senate Bill 74, is awaiting a hearing before the Senate State Affairs Committee. A similar bill, House Bill 597 by Rep. Ryan Guillen, D-Rio Grande City, also was heard on February 28 by the House Juvenile Justice and Family Issues Committee. It was also left pending. The three measures are being opposed by the Texas Daily Newspaper Association. The bill would require the Office of the Attorney General (OAG) to create and maintain an address confidentiality program to assist a victim of family violence, stalking, and sexual assault. In addition, the OAG would designate a substitute address for participants, act as the agent to receive and process mail received by the agency to participants. The OAG would also develop program and application information for participants. The bill also provides that the method of financing to implement these provisions may be from the compensation to victims of crime auxiliary fund. For purposes of analysis, it is assumed that approximately 1,989 participants would be included in the program in the first year and an approximate 5 percent growth rate would result in the program each following year. This information is based on comparison of other states that have similar programs. As a result of the estimated number of participants and the requirement that the OAG receive, process, and forward first class mail and any mail sent by the government for participants in the program, it is assumed that approximately 113,134 pieces of would be received and forwarded to program participants. As a result, it is anticipated that an additional 2 FTEs would be required to handle the volume of mail and subsequent processing. The salary cost for these additional FTEs would be approximately $76,410. In addition, related costs totaling $16,156 would be required for items such as furniture, computers, and telephones. Other consumables each year thereafter would be approximately $3,500. Also for purposes of this analysis, it is estimated that 1 additional FTE would required each year thereafter as a result of a projected 5% growth rate in the number of participants in the program. In addition to staff costs, it is assumed that approximately $83,000 would be required for envelopes, labels, and postage costs associated with forwarding mail to participants. For purposes of this analysis, a 5 percent growth rate per year in the volume of mail forwarded is assumed which would increase postage, labels, and envelopes by that percentage each year thereafter. The OAG would also provide assistance to participants in the form of program information material and assistance with completing program applications. As a result, an additional 2 FTEs would be required at a salary cost of $91,720. In addition, related costs totaling $16,156 would be required for items such as furniture, computers, and telephones. Other consumables each year thereafter would be approximately $3,500. Furthermore, a cost of $23,000 would be required for printing brochures and application forms. There would be no significant fiscal impact on technology. Costs to local governmental entities to implement the provisions of the bill would depend upon the number of people who register for the address confidentiality program. The Edinburg Consolidated ISD Board of Trustees has closed off the application process to fill the vacant superintendent of schools position, Dr. Jacques Treviño, school attorney, said Monday, February 26. Treviño said the district had received 18 applications from persons interested in the job. “Until further notice, Superintendent Gilberto Garza, Jr. will serve the Edinburg school district as interim superintendent,” said Treviño. Garza was appointed as acting superintendent of schools last August before the start of the 2006-2007 school year. He was named interim superintendent in December. Garza is a veteran educator (30 years) in the Edinburg school district who served as a teacher, an elementary school principal, and director of Elementary Education prior to being named by the school board as the interim superintendent of schools this. As an administrator and interim superintendent, Garza has the responsibility of guiding and influencing the direction of an education program that will serve the needs of all students. The Edinburg CISD is one the largest school districts in the Rio Grande Valley. It spans over 945-square miles and has s student membership nearing 30,000 in 35 schools. Edinburg’s retail economy in December, as measured by the amount of local and state sales taxes generated by a wide range of local businesses, was up 8.24 percent over the same month in 2005, the Edinburg Economic Development Corporation has announced. The EEDC is the jobs-creation arm of the Edinburg City Council. It’s five-member governing board, which is appointed by the Edinburg City Council, includes Mayor Joe Ochoa, former Mayor Richard García, who serves as board president, Fred Palacios, Mike Govind, and George Bennack. The figure translates into almost $1.3 million generated in local sales taxes in December. Those funds were sent in early February from the Texas Comptroller of Public Accounts, which collects the taxes from businesses, to the local communities in which the retail sales were made. Retail businesses are required to collect both the local and state sales taxes and send them to the Texas Comptroller of Public Accounts, which soon after returns the local sales tax back to communities in the form of a rebate. The local sales tax is used to help pay for dozens of major city services, ranging from new streets to city personnel. January state sales tax collections and February’s local sales tax allocations primarily represent sales made in December, but also include earlier sales by businesses that report sales tax to the Comptroller on a quarterly or annual basis. In December, Edinburg’s economy generated $1,290,247.84 in local sales taxes, compared with $1,192,007.34 in local sales taxes in December 2005. Edinburg registered the second-best showing in Hidalgo County in December, with McAllen outpacing all major cities in the Valley. McAllen’s economy generated more than $7.2 million in local sales taxes in December 2006, compared with more than $6.9 million during the same month last year. According to the comptroller’s office, Hidalgo County also showed continued prosperity. In December, all cities in Hidalgo County generated more than $13.6 million in local sales taxes, up 12.22 percent over January 2005, which reached more than $12.1 million. Neighboring Cameron County also registered economic growth, according to the state figures. In December, all cities in Cameron County generated almost $6.5 million in local sales taxes, compared with $6.1 million during the same month in 2005. •Weslaco’s retail economy generated almost $870,000 in local sales tax activities in December 2006, compared with more than $757,000 in December 2005, an increase of more than 14.8 percent. Rep. Verónica Gonzáles, D-McAllen, is a joint author of the Texas Prevention First Act (House Bill 1842), which aims to reduce unplanned pregnancies and curb the spread of sexually transmitted diseases (STDs). Gonzáles said HB 1842 would expand access to preventative health care services and education programs and save public health funds for Texans across the state. “I am proud to support the Texas Prevention First Act which will take essential steps to reducing unplanned pregnancies among our youth. Texas leads the nation in teenagers having babies, and one of every two deliveries in Texas is paid for with public dollars,” she said. The cost of helping women prevent unplanned pregnancies is a fraction of the cost of providing government services to indigent women and their babies, she noted. A year of family planning services costs $170 for one woman, compared to $8,500 for the first year of a Medicaid-funded pregnancy. Because of the cost effectiveness of family planning services, the federal government will provide $9 for every $1 Texas spends on our Women’s Health Program. At current levels, that program is projected to save the state $278 million over five years. However, at current spending levels, when the Women’s Health Program is fully implemented in 2009, the program is projected to serve only 12% of the eligible population. “Today’s investment in promoting the Women’s Health Program will benefit the State through significant savings to the State and federal government and dramatically reduce the abortion rate throughout Texas for years to come,” said Gonzáles. “Supporting effective education and promoting statewide outreach for family planning services are essential to the successful goal to reduce unplanned pregnancies and ultimately reducing the need for abortions. The Prevention First Act is common sense, middle ground, and cost-effective policy,” Gonzáles added. Gonzáles, Rep. Mark Strama, D-Austin, Rep. Rafael Anchia, D-Dallas;and Speaker of the House Pro Tempore Sylvester Turner, D-Houston, are joint authors for this legislation. “Everyone should agree that reducing unplanned pregnancies is key to reducing the number of abortions. The more women that participate in this program, the fewer unintended pregnancies and abortions will occur,” said Strama. Sen. Kirk Watson, D-Austin, and Sen. Jeff Wentworth, R-San Antonio, are authors of the companion (identical) bill in the Senate. Sen. Eddie Lucio, Jr. on Wednesday, February 28, joined his colleagues in the Texas Senate as it suspended rules to meet after they adjourned earlier in the day. Senate Resolution 384 passed with a majority vote. The idea that a situation like this could exist in our society, in Texas, in the 21st Century, speaks very poorly to our condition. 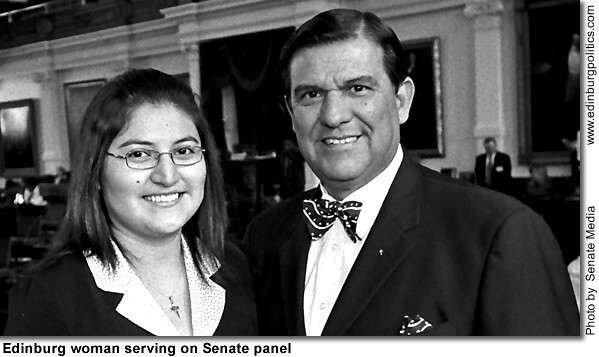 The 22-year-old recent anthropology graduate from the University of Texas Pan-American is excited to be assigned to the International Relations and Trade Committee at the Capitol that Sen. Eddie Lucio, Jr., D-Brownsville, chairs. Julie González, an Edinburg resident, underwent a rigorous selective process while trying to complete her studies to be considered for the Sen. Gregory Luna Legislative Scholar and Fellows Program. The program, named after the late Sen. Gregory Luna of San Antonio, provides undergraduate and graduate students the opportunity to gain experience and develop leadership skills as full-time legislative assistants in the Texas Senate during legislative sessions. Ms. González is fulfilling a five-month internship in the senator’s IRT Committee that he chairs. Her duties include researching policy matters, constituent issues and helping develop legislation. Some of her goals are to complete graduate school—she is currently applying to several schools—and one day work at the United Nations. She enjoys helping colonia residents get involved in the political process, and she has volunteered her time to organize carpools in the colonias for the voting polls. Ms. González has deep religious convictions and considers her family, her church and her education primary in her life. Construction on classroom wings at six elementary schools will soon begin following approval of Descon Construction LP of McAllen to serve as the project contractor. The Edinburg school board approved RFP#17-110 to build classroom wings at Canterbury, Escandón, Zavala, Guerra, Kennedy and Truman elementary schools at a cost of $5.6 million to address the growth in the elementary schools. In August, the school board adopted a district budget for the 2006-2007 school year which includes the funds necessary to build classroom wings to existing elementary schools to address rising student numbers at the elementary level. The district’s student enrollment is at 29,000 students. The bulk of the new growth continues to be seen at the elementary level where the increased numbers equate to more than one new elementary school. Elementary figures for all 27 schools reached 15,401or 703 more students than last school year. The majority of the new elementary growth is in grades one through four. The district has 2,514 first graders (an increase of 154); 2,375 second graders (an increase of 149); 2,297 third graders (an increase of 124); and 2,212 fourth graders (an increase of 115). Pre-kindergarten numbers are up by 69 students for a total of 1,348 students who attend a half-day of pre-school classes. The district has five elementary schools whose numbers have surpassed the 700 mark and four that are near to reaching it. The five schools feeling the added strain are Ávila Elementary with 771 students, Eisenhower with 778 students, Escandón with 724 students, Villarreal with 734 students and Treviño with 716 students. Nearing the 700 mark are Betts Elementary with 677 students, Freddy González with 660, Guerra with 655 students and Truman with 648 students. Lincoln, Cavazos, and Hargill Elementary Schools have been recognized by the Division of the No Child Left Behind Program Coordination at the Texas Education Agency (TEA) as Distinguished Title I, Part A Schools. The three Edinburg CISD schools are among 129 Texas schools recognized for their outstanding academic performance. According to the TEA, the campuses are being recognized for consistently strong academic performance while educating large populations of impoverished students during the three previous school years. •Earned an exemplary or recognized rating, which is the second highest rating in the state accountability system, during the two previous school years. The Edinburg CISD was one of five Valley school districts with schools recognized as Distinguished Title I, Part A Schools. Title I, Part A is a federal program under the Elementary and Secondary Education Act (ESEA). It provides supplemental funding to school districts with high concentrations of students from low-income families. Funds support programs that enable all children to meet the state’s student performance standards. These programs must use instructional methods and strategies that are grounded in scientifically based research. The performance standards increase each year in the state’s accountability system. Under the rating system in 2006, for example, schools that earned an Exemplary rating had passing rates of 90 percent or more on the Texas Assessment of Knowledge and Skills (TAKS) for all students and each student group; a passing rate of 90 percent or more on the State-Developed Alternative Assessment II (SDAA II) for all students; a high school completion rate of 95.0 percent and an annual dropout rate for students in grades 7-8 of 0.2 percent or less for all students and each student group. To earn a recognized rating, the campus must have at least 70 percent of students pass TAKS and SDAA II for all students and each student group; have a high school completion rate of 85.0 percent; and an annual dropout rate of 0.7 percent or less. AYP evaluations are based on participation and performance on state reading/English language arts (ELA) and mathematics exams in grades 3-8 and 10; graduation rates and attendance rates. The data are analyzed for all students and each of the following student groups that meet minimum size requirements: African American, Hispanic, white, economically disadvantaged, special education and limited English proficient. Edinburg CISD Interim Superintendent of Schools, Gilberto Garza Jr., said the Texas Education Agency bestows the prestigious Title I Distinguished School designation on identified Texas campuses due to their consistently strong academic performances while educating large populations of impoverished students during the three previous school years. Garza said to qualify for this designation in Texas, a school must be a Title I campus, have earned the state’s highest accountability rating (called exemplary) in the last school year and earned either an exemplary or recognized rating, which is the second highest rating awarded by the state, during the two previous school years. The honored schools are among 5,486 Title I schools that will receive $1.1 billion in federal funding through the Title I program in 2006-07. Federal law requires each state to identify those Title I schools that are meeting or exceeding the state’s definition of adequate yearly progress. The campuses will be recognized later this spring by their respective Education Service Centers. EHS senior Luis Emilio Quintanilla at attend Presidential Classroom Scholars Program in D.C.
Edinburg High School senior Luis Emilio Quintanilla will attend the Presidential Classroom Scholars Program, in Washington D.C.
Presidential Classroom expands students’ knowledge of politics, government, and roles and responsibilities of institutions and organizations involved in policy-making. Through interactive sessions with international policy-makers, diplomats, scientists, military leaders, journalists, public officials and others, Luis will gain insights into the complexities of the policy-making process, as well as the interaction between government entities and organizations around the world. Luis will work with peers from all over the nation on a group project throughout the week, applying new skills and ideas immediately after learning them. Congressman Henry Cuellar, D-Laredo/McAllen, on Friday, March 2, announced that the Food Bank of the Rio Grande Valley has been awarded $247,500 from Housing and Urban Development. The Food Bank of the Rio Grande Valley is the fourth largest in Texas, and includes Starr, Hidalgo, Cameron, and Willacy counties. The grant is approved as an Economic Development Initiative (EDI) Special Project, a program under HUD. “This grant will help further the Food Bank project, which assists many communities across the Rio Grande Valley,” said Cuellar. •To enhance the feasibility of the economic development and revitalization projects that they finance. Health and Human Service Commissioner Albert Hawkins appeared before the Senate Nominations Committee on Wednesday, February 28, to seek re-approval for his appointment, but Senators were less interested in his past performance than how he would administer a controversial vaccination program. Earlier this year, Gov. Rick Perry issued an executive order directing the Commissioner of the HHSC to create guidelines requiring a vaccination for the human papillomavirus (HPV) for young girls entering the sixth grade. This has proved to be a controversial order, which has raised questions about the balance of power in state government, parents’ rights, and possible connections between the Office of the Governor and the company that makes the HPV vaccine. Hawkins began by laying out the agency’s accomplishments since he took over in 2003. He says under his watch, HHSC has eliminated administrative waste and redundancies, implemented a preferred drug program that has saved the state $488 million since 2004, and improved Medicaid service. Eltife, who after repeatedly rephrasing the question, was unable to get Hawkins to commit to a yes or no answer, and said that he could not support Hawkins’ nomination if he could not give a direct response. Sen. Jane Nelson, R-Lewisville, who chairs the Senate Health and Human Services Committee, tried to get Hawkins to answer the emergency question another way, asking him to rank the top ten health issues facing Texas. Along with Medicaid, treatment of the elderly and disabled, and uninsured Texans, Hawkins said he felt that cancer treatment and prevention, including cervical cancer, was a top ten issue. Nelson was also unhappy that a HPV study report mandated by one of her bills last session had not been delivered to Legislators by the stipulated date. “If I was the boss, and I found out who was in charge of getting that report to the Legislature, heads would roll,” she said. Hawkins promised to discover why the report had yet to be delivered. Following about two hours of questions, Nominations Committee Chairman Mike Jackson, R-La Porte, left Hawkins’ nomination as pending business before the committee to be voted on at a later date. Also on February 28, Senate Education Committee Chair Florence Shapiro, R-Plano, announced legislation that would give parents with children with autism the right to transfer their children into schools that have better autism education programs. Autism is a neurological disorder that impairs societal skills along a broad spectrum. It is the broad range of symptoms, said Shapiro, that makes it so hard to offer special education services to autistic children. “Because symptoms can vary so greatly, a program that works for one child may not be effective for another,” said Shapiro. “That is why individualized programs are so important.” Senate Bill 1000 gfhywould permit parents of autistic children to move their children into another school, including an accredited private school. Schools that take these students would be reimbursed by the state at the same amount the student would receive in state funds at their old schools. The Senate will reconvene Monday, March 5 at 3 p.m. Session video and all other webcast recordings can be accessed from the Senate website’s audio and video archive pages. Sen. Judith Zaffirini, D-Laredo, filed legislation on Wednesday, February 28, to combat the use of “botnets”—networks of compromised computers used to perpetrate cybercrime. Senate Bill 1009 by Zaffirini will prohibit the creation of botnets and penalize convicted violators with significant fines. SB 1009 will define clearly the term “bot” as a software program that operates as an agent for a user, another computer program or simulates human activity, and “botnet” as a collection of computers that become compromised without the knowledge of the owner or operators. Compromised computers either run under a command and control infrastructure or are used to forward transmissions, including unsolicited e-mails and viruses, to other computers with online access. What’s more, the bill will authorize civil penalties for using botnets, including a cause of action for victims, and authorize the attorney general to seek injunctive relief and recovery of damages of $100,000 per violation. Similar to SB 6 filed last week, SB 1009 builds on Zaffirini’s legislation that protects families from online crimes. In 2005 she authored and passed SB 327, the Consumer Protection Against Spyware Act, which made it unlawful for a person or entity to knowingly install spyware. The protections created by SB 327 produced a multimillion dollar settlement with Sony BMG Music, which installed harmful and problematic “spyware” on more than 100 compact discs sold to Texas consumers. In 2005, Zaffirini also sponsored and passed HB 1098 by Rep. Brian McCall, R-Plano, which prohibited internet “phishing” or fraudulent websites and e-mails sent to induce victims to divulge personal financial information. Starting in the fall 2007 semester, South Texas College will be offering a new Mexican-American Studies Program (MASP) providing students the opportunity to learn about more than 4,000 years of Mexican-American history, culture and heritage. Students following the program will earn a full Associate of Arts in Mexican-American Studies, which will provide a solid foundation for bachelor’s programs in Mexican-American Studies, education, English, government, political science, economics, history, art, business or a variety of other subjects. STC is only one of six college’s offering a degree program in Mexican-American Studies in the entire state of Texas. Others include The University of Texas-Pan American, The University of Texas-Austin, The University if Texas-San Antonio, The University of Texas-El Paso and Sul Ross State University. In addition to 15 credit hours in the MASP field of study, students interested in the program must take “Introduction to Mexican American Studies” and earn 45 credits in the college’s core curriculum. It is anticipated that the program will also overview local Valley culture and history, focusing on important influences originating from the Valley like Tejano and Conjunto music, Tex-Mex food and language deviations, political forces, as well as other topics. To supplement the degree program, Mexican-American Studies Clubs will also be available for student participation at each of STC’s three campuses. The clubs will support academic instruction, providing opportunities for participation in a variety of cultural events, hands-on leadership projects and service projects. For more information about this new program, area residents may contact Gilberto Reyes, Jr. at 872-2170 or greyes@southtexascollege.edu. Joaquín A. Rodríguez, a senior at Edinburg High School and a 2007 Texas Youth of the Year finalist for the Boys and Girls Club of America, on Tuesday, February 27, was honored for his many achievements by the Texas Senate. RESOLVED, That a copy of this Resolution be prepared for him as an expression of esteem from the Texas Senate. WORK SESSION AGENDA 6:00 P.M. I. Presentation on La Sienna Development by Bill Calderon with Hawes Hill Calderon LLP. II. Discussion and Update on the Construction of Lift Station No. 25. REGULAR MEETING AGENDA 7:00 P.M. I. CALL TO ORDER, ESTABLISH QUORUM. II. CERTIFICATION OF PUBLIC NOTICE. A. Presentation of Proclamation Recognizing March 2007 as National Colorectal Cancer Awareness Month. B. Presentation of Proclamation Recognizing March 4th-10th as Severe Weather Awareness Week. C. Consider Presentation of Delinquent Tax Collection Report for the period of October 01, 2006 to February 28, 2007. A. Hold Public Hearing and Consider Ordinances Providing for a Comprehensive Plan Amendment From Auto-Urban Uses to General Commercial Uses and the Rezoning Request From R-A1, Single Family Residence District to C-2, General Business District, being 1.23 acres out of Lot 12, Block 2, Santa Cruz Gardens Unit No.3 Subdivision, located approximately 170.70 feet east of Gwin Road on the north side of Monte Cristo Road, as requested by Estefana Galvan. B. Hold Public Hearing and Consider Ordinance Providing for the Rezoning Request from R-A1, Single Family Residence District to C-1, Local Business District, being 0.506 acre tract of land, more or less, out of lot 2, Section 275, Texas-Mexican Railway Company Survey, located approximately 433.50 feet south of Sprague Street on the east side of McColl Road, as requested by Amando Guerra. C. Hold Public Hearing and Consider Ordinance Providing the Renewal of a Special Use Permit for an On-Premise Consumption of Alcoholic Beverages for Mango’s Sports Bar, being 1.87 acres out of Lot 5, Block B, Edinburg Adjacent Acreage, located at 909 North Closner Boulevard requested by Jose Francisco Quevedo. D. Consider an Ordinance of the City of Edinburg, Texas Finding, after Reasonable Notice and Hearing, that AEP Texas Central Company’s Existing Rates are Unreasonable; Finding that AEP Texas Central Company’s Requested Revenues Resulting from Electric Transmission and Distribution Rates and Charges within the City Should be Reduced; Determining Just and Reasonable Rates; Adopting Recommendations of Consultants; Providing for Recovery of Rate Case Expenses; Preserving Regulatory Rights of the City; Providing a Waiver of the Three (3) Separate Readings; and Ordaining Other Provisions Related to the Subject Matter Hereof. Consider Appointments to the City Advisory Boards and Committees for the Following: Environment Board, Two Members, Community Development Council-Area 10, One Member, Parks and Recreation Board, One Member, Civil Service Commission, One Member. A. Consider Awarding Bid No. 2007-44, Demolition and Reconstruction of a Two-Story Burn Complex to 5 Star Construction. B. Consider Awarding Bid Number 2007-52, Reconstruction of One (1) Residence in the Housing Assistance Program to Benchmark Construction. C. Consider Awarding Bid Number 2007-54, Reconstruction of One (1) Residence in the Housing Assistance Program to Benchmark Construction. D. Consider Awarding Bid Number 2007-55, Colonia Rodriguez Water & Drainage Improvements to JLV Utility Construction, LLC, in the Amount of $222,540. E. Consider Awarding of Bid Number 2007-57, Replacement of Plant Lift Gate Valves to American Machine Shop & Pumps, in the Amount of $45,000. F. Consider Awarding Bid Number 2007-58, Lift Station No. 22-Pumps & Valves to American Machine Shop & Pumps, in the Amount of $24,892. G. Consider Awarding Bid Number 2007-61, 2007 Haul Truck to South Texas Freightliner, in the Amount of $84,270. H. Consider Awarding Bid Number 2007-62, 2007 End Dump Trailer to Rush Equipment Centers of Texas, Inc., in the Amount of $61,125. I. Consider Purchase of Aeration Diffusers for the Utility/Wastewater Treatment Plant from Hartwell Environmental Corporation, in the Amount of $42,940. J. Consider Selecting a Qualified Firm for the Construction Materials Testing and Geotechnical Services for the Edinburg West Water Treatment Plant and Authorize the Interim City Manager to Negotiate a Professional Services Agreement. K. Consider Authorizing Interim City Manager to Accept Improvement Proposal and Execute the Necessary Construction Agreements for Improvements at the Edinburg Baseball Stadium, as submitted by Edinburg Equities, LLC. A. Consider Resolution to the Board of Directors of the South Texas Higher Education Authority, Inc.; Approving Directors and Terms. B. Consider Resolution by the City Council of the City of Edinburg, Texas, Relating to the Issuance of Obligations by the South Texas Higher Education Authority, Inc.; Approving the Issuance of Such Obligations; and Making Certain Findings in Connection Therewith. C. Consider Authorizing Interim City Manager to Accept Proposal and Enter Into an Engineering Agreement with Golder Associates, Inc. for the Preparation and Procurement of an Air Emission General Operating Permit as Mandated Under Title 30 Chapter 122 of Texas Administrative Code, Pending Approval of Final Form by Interim City Manager and City Attorney. The City Council will convene in Executive Session, in accordance with the Texas Open Meetings Act, Vernon’s Texas Statutes and Codes Annotated, Government Code, Chapter 551, Subchapter D, Exceptions to Requirement that Meetings be Open, §551.071, Consultation with Attorney and §551.074, Personnel Matters; Closed Meeting. 1. Settlement Proposal Regarding Cause No. CCD-1493-A; City of Edinburg vs. Grande Valley Homes; In the County Court at Law No. 1 of Hidalgo County, Texas. 2. Evaluation of City Attorney. 3. Discussion on Personnel Matters: Search for City Manager. 4. Discussion: On Construction of Lift Station No. 25. The City Council will convene in Open Session to take necessary action, if any, in accordance with Chapter 551, Open Meetings, Subchapter E, Procedures Relating to Closed Meeting, §551.102, Requirement to Vote or Take Final Action in Open Meeting. I hereby certify this Notice of a City Council Meeting was posted in accordance with the Open Meetings Act, at both bulletin boards located at the main entrances to the City Offices of the City of Edinburg, and at the 210 West McIntyre entrance outside bulletin board, visible and accessible to the general public during and after regular working hours. This notice was posted on March 2, 2007 at 7:05 p.m.